Animated STAR TREK - "The Eye of the Beholder"
Beaming down to a planet to search for the crew of the missing ship Ariel, the U.S.S. Enterprise crew is captured by a race of super intelligent slug creatures and become part of a zoo collection. PSA epilogue for "The Eye of the Beholder"
This episode's author, David P. Harmon also wrote the original STAR TREK episodes "The Deadly Years" and "A Piece of the Action." The aliens in "The Eye of the Beholder" would have been impossible to do in a live action series. An optical sequence from the original series in which the camera zooms into the top of the Enterprise's saucer section was rotoscoped for use in the animated series. In this episode, a purple flying lizard-like creature (see picture above) menaced members of an Enterprise landing party. The animated sequence made use of drawings originally created for the flying plant creatures that menaced the Enterprise landing party in "The Infinite Vulcan". Another example of similar life forms evolving on different planets. 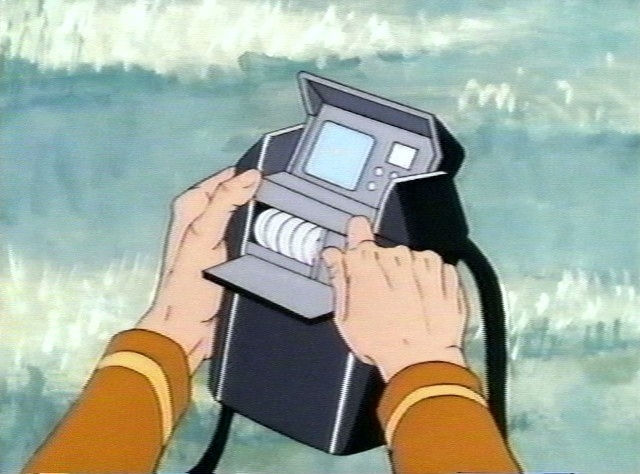 The scientific tricorder is a hand-held sensing, analysis and computation device which is standard equipment for all Starfleet landing parties. Medical tricorders are often carried by medical landing party members. In this episode, Kirk replies to McCoy's mention of the mission being too much risk by saying "That's why we're here, Bones." This is a subtle reference to the original series episode "Return to Tomorrow" when Kirk stated that "Risk?... Risk is our business!" Lactrans were immensely intelligent, telepathic sluglike beings. They maintained a zoo on Lactra VII. Their telepathy was so swift and complicated that Spock could only get fleeting impressions of their transmissions. 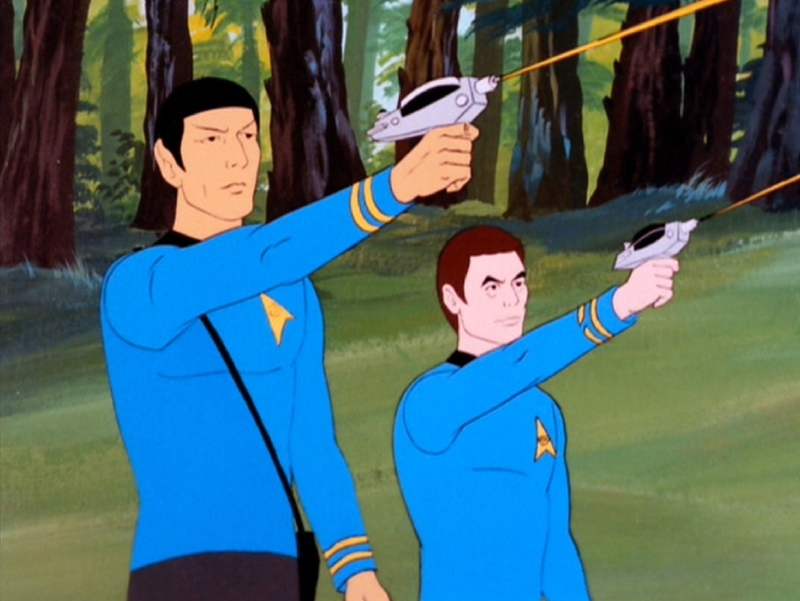 The powerful Type-2 pistol phasers come in handy when fending off large and hostile life-forms. Type-3 rifle phasers, mentioned in "Bem", are even more powerful than these phaser pistols. The Uniforms & Insignia page within this site has a section devoted to starship insignia patches including the S.S. Ariel's insignia. There was a seventh season STAR TREK: The Next Generation episode "Eye of the Beholder", and also a classic Twilight Zone episode by that name. 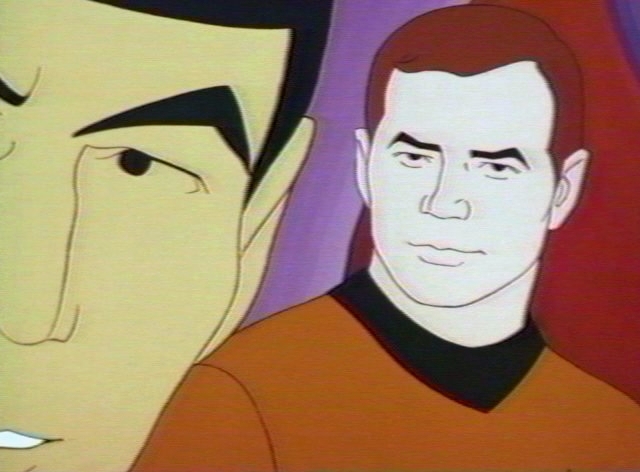 This episode had a visual error: in a close-up Spock had normal eyebrows. (Picture showing this error). As commanding officer of the S.S. Ariel, Lieutenant Commander Tom Markel seriously violated fundamental Starfleet regulations when he beamed down along with his entire crew and abandoned his ship in orbit. The scientific starship S.S. Ariel was likely named after Ariel, a fictional sprite who appears in William Shakespeare's play The Tempest. In this episode, Transporter chief Kyle was seen briefly operating the transporter console when the baby Lactran was beamed aboard, however he had no dialogue. There also was a STAR TREK novel by A. C. Crispin entitled "The Eyes of the Beholders" published by Pocket Books in September 1990, but it is an entirely different story. Another small error in the episode: Lieutenant Commander Tom Markel was shown with Commander stripes and with a sciences insignia on his yellow command uniform. "The Eye of the Beholder" was novelized by Alan Dean Foster in Star Trek Log Eight published by Ballantine Books in August 1976. The entire book was devoted to this one episode.